On the Sixth Street bridge before its demolition. Photo by Pete Galindo. It’s a mild Saturday night in January. 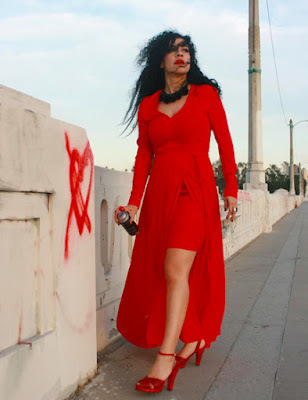 Lysa Flores has accepted an invitation to play at an event commemorating the release of a high profile Latino literary magazine being held in the private home of a respected Chicana historian turned documentary filmmaker and her husband, a well-known, award-winning novelist and former LA Times staff writer. Dressed in black and armed with a fire engine red Fender Telecaster, Flores is joined by drummer Fredo Ortiz and break-out prodigy Giovanni Verduzco on electric bass. What was supposed to be a half-hour set is extended by a barrage of audience requests for encore after encore. Flores is happy to comply. Her voice, long lauded as a uniquely powerful extension of her poignant and riveting work as a songwriter, is compelling. Honest and honed, it resonates with a razor sharp readiness. The living room crowd is understandably weighted in favor of writers, journalists and academics. They engage in private conversations, gather around the taquero parked on a wooden deck outside and mingle. But from the moment Flores first brandishes her guitar and lets go with a defiant riff, they are transfixed. Lysa Flores is back. It’s as if she never made the decision to withdraw from music seven years ago to take stock of her life and put herself back together. After defending her rights as a songwriter and an artist in a contentious divorce then literally defending herself during a subsequent relationship with an abusive boyfriend that ended with a miscarriage, Flores explains, she made the conscious decision to step away from a career that had, until then, been marked mostly by critical praise, performances with legendary artists across the spectrum of styles and genres, and successful tours across the U.S. and Europe. “I think it has to do, number one, with getting to where I was questioning my own identity and self-worth and everything that happens when you become a victim of violence and loss,” Flores says over coffee in a tranquil, terraced patio tucked away discreetly in El Sereno. The return to her work as both bard and troubadour after her self-imposed exile was paralleled by the birth of her now three-year-old daughter Viviana. The former Elvette, who once toured as part of the El Vez (Robert Lopez AKA the Mexican Elvis) & the Memphis Mariachis Vegas-style, tongue in cheek send up, glows with the unbridled joy gleaned from a mature and contemplative motherhood. “So I think I got to the point where I feel comfortable speaking about it now, and I think that it’s part of my experience as an artist to be able to speak to it and be able to own it as part of my experience,” Flores confides, alluding to the disastrous and painful romantic entanglement with a well-known musician that followed the sudden, and for her, unforeseen dissolution of her marriage. A day job with a high profile fashion retailer and the fulfillment that has come with her role as a mother have allowed her the space and distance she needed, she says, to reflect and heal. And based on the furious pace of notable recording projects suddenly piling up around her—two albums of her own, two she is producing for others and a fifth as a vocalist—her time away from the industry just might have been the calm before storm, a lyrical and musical whirlwind that will mark a segue to the next step in an illustrious, watershed creative period. With respect to her withdrawal, Flores is circumspect, never referring to anyone in her personal life by name. But she is still frank with details and a slew of harrowing recollections as well as a recap of how a number of those events played out legally. “That was all part of my transition from music and having to take a break and now putting out a CD,” Flores says. Only a few weeks after the intimate and surprisingly powerful performance in the Mt. Washington hilltop home, she wears a bright red overcoat and sits confidently with a calm, even regal bearing. The album she debuts this month, It Hurts to be Your Girl, was recorded six years ago and is the symbolic string of yarn that leads her back to herself. The record is, she reveals, “very personal and graphic. I do talk about losing my son [who] I was five months pregnant [with] at the time.” The revelatory, cathartic and ultimately redemptive and healing nature of the project, highlighted by a song titled “You Took it Too Far,” is Lysa Flores at her stripped-down and visceral best. The track features her playing single string notes through the entire song. She is joined by one drummer and one bass player on each the album’s tracks. Both It Hurts to be Your Girl and Immigrant Daughter, an album recorded a full nine years ago, are being released on her Bring Your Love label. The latter CD, slated for release later this year, features some of Lysa’s musical heroes, like John Doe and five-time Grammy Award-winner Flaco Jiménez, among many others. Beyond those two very personal album projects, Flores is also producing the re-release of a spoken word CD by writer Michele Serros, whose life was prematurely claimed by cancer in 2014. She is also proud to be producing the first-ever album by LA punk rock icon Alice Bag, whose real name is Alicia Armendariz and who has long been one of Flores’ heroes. “I was originally asked to be the vocal producer, but once we started working together, she asked if I would co-produce the whole album,” Flores says. “We got together a while back with a band called Stay at Home Bomb.” Her fifth recording project is a record for Maceo Hernández, the Demon Drummer from East LA who plays the Japanese taiko drum with whom Lysa has performed and toured for several years. That album, she says, is being produced by Quetzal Flores, an artist who needs no introduction at this point. Her life in music, she recalls, began at 12, when she borrowed her older brother’s guitar without his consent. While he was away at summer camp, she took advantage of his absence and taught herself to play. Faced with his wrath and his need to scold her in front of friends, most into punk and metal by then, she was determined to prove that her clandestine guitar practice had not been in vain. “They said I probably couldn’t even play. I said ‘yes, I can,’ and played them a song I had written. His Hessian friends were all surprised,” she says with a grin. Moving from East LA to suburban Rowland Heights in the middle of her freshman yearl at Garfield, Flores was already a driven overachiever. “I went to Garfield for about half a year. So I don’t have any Jaime Escalante stories,” she admits with a slight laugh. Stranded in Rowland Heights, she and a friend borrowed the business license that belonged to her friend’s mom to purchase Doc Martens wholesale over the phone and sell them to other students to help make ends meet at home, where she was one of five children born to immigrant parents. “I was the kid who would buy candy in bulk and sell it at school to make a buck,” Flores says, giving her precocious young adult business savvy a precedent. What began as a mission to outfit her contemporaries in cool, punk-inspired togs brought her to the music scene and further stimulated her desire to create music of her own. At 15, she and a friend opened a store called Monkeys to Go, and not long after, she began cutting her teeth as a back-up vocalist for The Longfields, a now defunct LA alt-rock band. The store itself was the result of trying to find an alternative to the brutal three-bus trek from Rowland Heights to Melrose in Hollywood to find the styles she preferred or to hang out with her friends from East LA. With The Longfields, she earned her stripes on the road playing venues of every size across southern California and recording vocals with them in a studio. When they were reluctant to consider playing any of her original material, she took the advice given by her friend and collaborator DJ Bonebrake of legendary punk group X, who had joined The Longfields temporarily for a tour, and struck out on her own. Alone, she gravitated to the musical scene at downtown LA’s Troy Café. Flores launched Bring Your Love Records in 1998 and released her first full-length album, Tree of Hope, to positive reviews. Her life after that unfolded like a fairytale, if the mountain of press she garnered in national media like Newsweek, InStyle, USA Today and Latina Magazine is any indication. 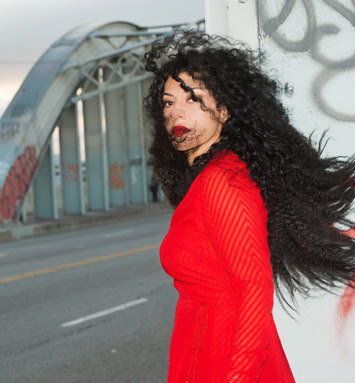 Sweet and genuinely nice, she makes no mention of her status as the public face and the darling of the Chicana alt-rocker movement, drawing comparisons to everyone from Joni Mitchell to Alanis Morissette. In the hideaway El Sereno backyard garden, she is content to reel off the list of new CDs in the pipeline. She has returned to her childhood home, where she lives alone with her daughter as a single mom. She has learned to appreciate having waited until now to have a child because, if anything, she has learned to have a more patient approach with respect to life and it’s circumstances. “It’s near 3rd and Mednick, in East LA,” she says about the home her parents held onto after they moved further eastward. She is understandably excited about the new album because, beyond its value as an exorcism, it features collaborations with visual artists and long-time friends John Valadez, Raúl Baltazar and Pete Galindo, all of whom have contributed photos to the aforementioned CD jacket. The songs assembled therein, led by a single titled “You Took it Too Far,” are evidence of an acceptance and an embrace of her own talent, power and autonomy, of the validity inherent in her experiences and her voice. The album is simultaneously a sonic and visual statement that represents her liberation. In the end, she confesses, it was her daughter Viviana who brought her back to the music. “I started feeling a void when it came to Vivi because she wasn’t getting to know her mother as an artist. But then one day, when she first started speaking, she walked into the room, went straight to the guitar case and said ‘Otter, máma. Otter,’ like she was asking me to take the guitar out and play it,” she says with more than a slight trace of awe at her child’s instinctive need to hear her mother share music. The word “otter,” she realized, was Viví’s way of saying “arra,” short for “guitarra,” the Spanish word for guitar.